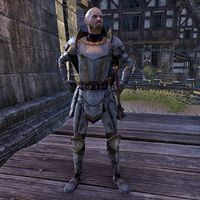 Captain Ernele is a Breton member of the Wayrest City Guard and formerly served under General Godrun. He is overseeing the construction of the guillotine in the center of the Merchant District. "Don't worry. We're not erecting a guillotine to start executing citizens willy-nilly. It's just a deterrent. The Supernal Dreamers are trying to recruit people all over Stormhaven. This might remind them why joining would be a bad idea." Captain Ernele can be spoken to once Another Omen is started. "I recognize you from the stories. You're the one who helped save Count At-Tura, aren't you? He's...an old friend." I'm glad to make your acquaintance. Don't mind the guillotine. It's just for show." "Well, you know as well as anyone else. These Supernal Dreamers have been trying to recruit people all over Stormhaven. We're hoping this will serve as a deterrent. If we catch a cultist, we'll execute him. Nothing more than that." King Emeric said you just returned from Gavaudon. "Sure enough. I was acting liaison to General Godrun out at Shinji's Scarp, but he's worried that the ogres might break through and attack Wayrest. Godrun suggested to the king that I be assigned to organize defenses here, so here I am." Was anyone in Gavaudon having nightmares? "Not that I know of. General Godrun's been losing sleep, worried about the ogres, but other than that, everyone's been sleeping just fine...or at least as well as you can expect for a war camp. General Godrun is acting a little stranger though." "It's not my place to question the general, but he does seem to be blowing the ogre threat out of proportion. That's just my two coppers, though. Good luck if you're headed out to Gavaudon." The ogres could attack Wayrest? "Between you and me, I really don't think so. General Godrun has done a good job. The orcs have driven the ogres almost back into the mountains. Morale at Shinji's Scarp is quite high." I'd say that's a little excessive. "Really? I heard there was a woman who joined the cult in Alcaire and tried to murder her husband. We don't look too kindly on that. You didn't come here to talk about politics though, did you?" Once he has been questioned he has a final farewell for the player before he sends them on their way. "I can't wait to tell my uncle I met you, Count At-Tura speaks very highly of you. Good luck in Gavaudon. Kill an ogre for Captain Ernele while you're out there!" He is spoken to once again to get him to start dismantling the guillotine. "Aha! So you returned from Gavaudon with another feather in your cap? Defeating the Ironhand Ogres? Wish I could claim such an accomplishment. Frankly, it's an honor to know you. Is there anything you need from me?" The king asked me to make sure the guillotine is getting destroyed. "Why yes! Of course. Yes! Take it down and burn it! The king told me this was of the highest priority. I'll admit——I thought he was joking, but I assume he wouldn't have sent you if that was the case. This page was last modified on 16 October 2018, at 20:26.